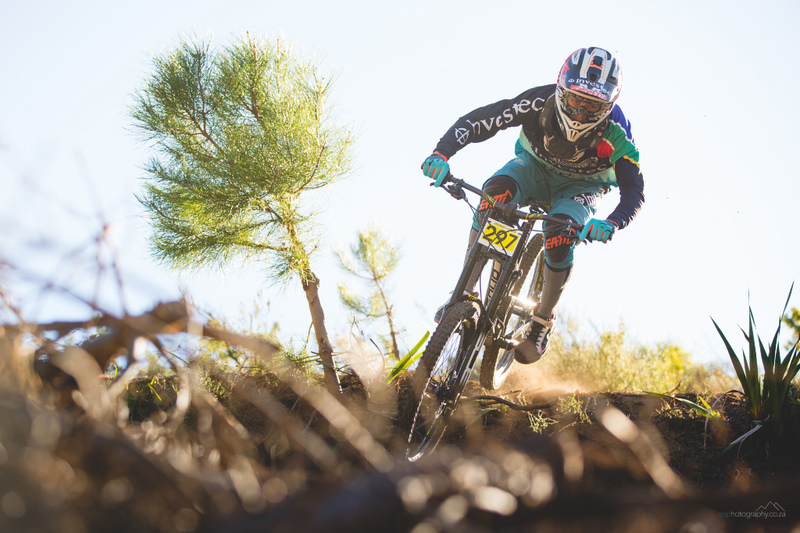 Stefan Garlicki (Solid Reverse Factory Racing) won Round Three of the South African National DH series at Cascade Manor on Sunday 1 May. Garlicki claimed his second win in the National Series when he beat Christopher Philogene and Theo Erlangsen in a time of 02:01.652, a comfortable winning margin of some four seconds. Due to a heavy travel schedule leading up to the event (Garlicki has been campaigning on the UCI World Cup circuit) he almost didn’t race, but because the event took place only some 20 minutes from his home, he decided to go out and have a roll. The 1.4-kilometre track descends 250-metres and is 95% covered by Pine trees. It features a few technical switchbacks at the top before running into a notoriously steep middle section, of which the main obstacle is a step-down road gap with a tricky landing. From there it flattens out and opens up as it exists the forest toward the finish line. “In seeding run I tried to keep it smooth and not make too many mistakes while not pedalling too much,” Garlicki explained his strategy on the day. "I managed to have the fastest seeding run but it was really close – .01 of a second or something to Theo – but I knew that I hadn’t pedalled much, so I could realistically go three or four seconds faster in the race run,” he said. From Garlicki returns to Europe to compete in the German Cup series, the European Cup Series and the next round of the World Cup. The South African National DH Series moves to Pietermaritzburg for the next event.